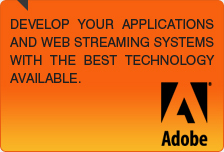 Adobe Media Server Streaming hosting provider. Starting from 9 euro/mo. Adobe Media Server Hosting Plans"Stream Start"
Flash Media Server Hosting Plans "Stream Wide"
The table below explains the relationship between the user bitrate and the maximum bandwidth available. The maximum connections must be divided by rtmp users and http users. * The costs are VAT (22%) except - for contracts less than 12 months there is a setup fee of € 40.00+VAT (22%).